The 10 Best Mini Golf Courses in Wisconsin! It’s time to work on your (mini) short game! In Wisconsin, you’ll find a variety of mini golf courses waiting to be enjoyed by friends and family. Overcome the adversity of hitting around obstacles and impress everyone by scoring that hole in one. Here are the 10 best mini golf courses in the state. Vitense Golfland is the perfect place for a round of mini golf when in the Madison area. Enjoy 18 holes of an indoor mini golf course, 18 holes of the California outdoor mini golf course, and 18 holes of the Wisconsin outdoor mini golf course. There is so much more added fun at Vitnese if not everyone in the party likes mini golf! Located in New Galrus, Swissland mini golf course is open from May to October. They offer 18 holes of Swiss themed fun! You’ll love the challenging holes that you’ll find at Swissland! Everyone loves the mini golf course at Pirate’s Cove Adventure Golf in the Dells. Enjoy 91 unique golf holes over the course of five different courses. Put your putting skills to the test at one of the state’s most famous mini golf course. Red Putter Mini Golf is the perfect way to pass sometime in the Door County area. You’ll be surprised how much fun you’ll family will have at an affordable rate. This course is challenge yet still applicable for all levels and ages. Test of your skills today! Exciting, yet challenge—you’ll find yourself having so much fun at Paradise Gold Park. Eighteen holes of beautifully crafted course on a fun terrain will keep your family occupied for hours. From beginners to those seriously working on their putting game, all will find fun at Paradise Golf Park! Tee Air is beautifully landscaped with a challenging layout with premium Astro Turf greens. You’ll play through 18 mini golf holes at a great price. They even offer party rates for even more added fun for all of those special occasions. Badger Sports Park is a one stop shop family owned entertainment center. Their 18-hole mini golf course has water hazards, sand traps, and rocks. Badger Sports Park course is thoughtfully designed with specialty holes featuring a mini Lambeau Field and Wisconsin Timber Rattler stadium. Racine’s very own Mulligans miniature golf course is newly renovated with beautiful greens. Their 18-hole course offers challenging and exciting twists and bends to throw even the best of them off. Play through caves and waterfalls. You’ll find yourself getting better after every stroke. Perfect your putting here at Pioneer Mini Golf in Westfield, Wisconsin. Made for beginners and veterans alike, you’ll find all sorts of fun on the course. 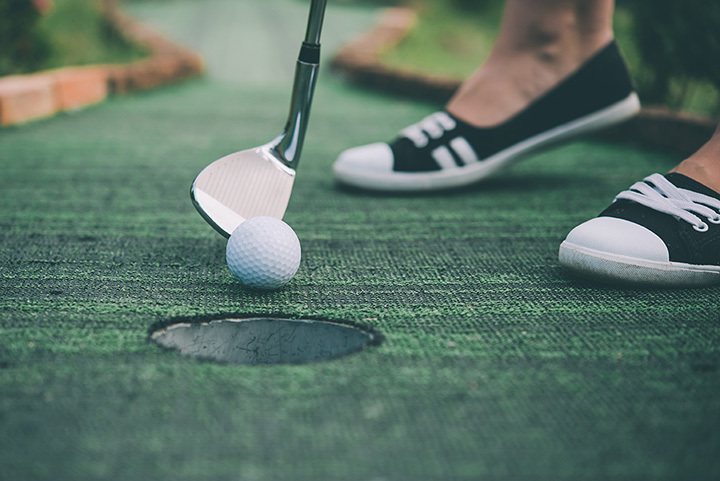 Score a hole in one and earn a free game at Pioneer Mini Golf. Tons of family fun to be hat in Westfield.